Should you get your nutrients from food or from supplements? Try to improve your diet before turning to supplements. Food has beneficial nutrients, such as flavonoids and antioxidants, that aren't in most supplements. Supplements can plug dietary gaps, but nutrients from food are most important. The fresh food you eat is loaded with nutrients necessary for good health, such as magnesium, calcium, and vitamins A and C. But many older adults aren't getting enough nutrients from their diets. The typical American diet is heavy in nutrient-poor processed foods, refined grains, and added sugars—all linked to inflammation and chronic disease. Yet even if you eat a healthy, well-balanced diet, you may still fall short of needed nutrients. That's a consequence of aging. "As we get older, our ability to absorb nutrients from food decreases. Also, our energy needs aren't the same, and we tend to eat less," explains Dr. Howard Sesso, an epidemiologist at Harvard-affiliated Brigham and Women's Hospital. Can a supplement make up the difference? "It's a touchy subject, and you need to look at your individual needs first," says Dr. Sesso. 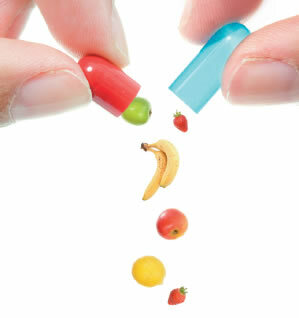 Dietary supplements would seem to be the obvious way to plug gaps in your diet. But taking too much can actually harm you. For example, you can get too much of a particular nutrient without realizing it. "Extra vitamin A supplements can lead to dangerous, toxic levels if taken too frequently," notes Dr. Clifford Lo, an associate professor of nutrition at the Harvard School of Public Health. The evidence about the benefits of multivitamins is mixed. Dr. Sesso was a lead researcher in one of the largest studies to date on multivitamins, the Physicians' Health Study II, which found that multivitamins were associated with a small reduction in the risk of cancer and cataracts in men, but did not reduce deaths from heart disease. A study published March 1, 2015, in TheJournal of Nutrition found that a multivitamin with minerals lowered the risk of death from heart disease in women, but not in men. However, a review of a number of studies, published in Annals of Internal Medicine in 2013, found that multivitamins showed no benefit in preventing early death. Because the findings from these and many other studies conflict, the U.S. Preventive Services Task Force doesn't support vitamin and mineral supplements to ward off disease. Both Dr. Sesso and Dr. Lo advise that you try to improve your diet before you use supplements. That's because nutrients are most potent when they come from food. "They are accompanied by many nonessential but beneficial nutrients, such as hundreds of carotenoids, flavonoids, minerals, and antioxidants that aren't in most supplements," says Dr. Lo. Plus, "food tastes better and is often less expensive than adding supplements," says Dr. Sesso. "Work with a dietitian, and try to get a sense of what's missing from your diet and what changes might be considered." If you are unable to make dietary changes, or if you have a genuine deficiency in a particular nutrient, such as vitamin D, both doctors say that a supplement may be helpful. Just be careful; the manufacture of supplements isn't monitored by the government in the way that the manufacture of pharmaceuticals is—so you can't be sure exactly what you're getting. Bottom line: "Look for a multivitamin with D and B vitamins (especially folate), iron, magnesium, and calcium," says Dr. Sesso, "and go for a well-known brand that's been around for a long time and is likely well tested." Dairy products, fish such as salmon and sardines, and dark, leafy greens.